Does the new flood map affect you? located within a Coastal Barrier Resources System. One click will display what has changed, the current flood zone designation, and the base flood elevation. Revision 2, 2/26/2014: Coastal Barrier Resources System overlay and map legend added. Revision 1, 1/3/2014: Washington County and preliminary Bristol County FIRM data added. Install Google Earth if you don’t already have it. Save the file to your computer. Double clicking the saved file will open the map in Google Earth. Uninstall any old versions of the map saved in Google Earth. In Google Earth, select the old map on the left under “Places” and press Delete. 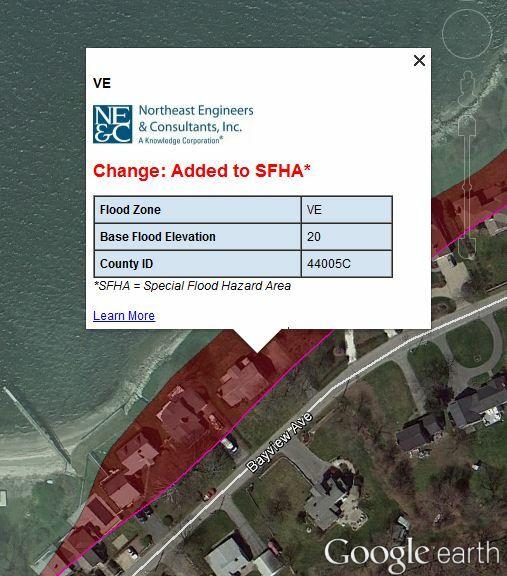 Click on a highlighted area for details including the change, the flood zone, and the base flood elevation. 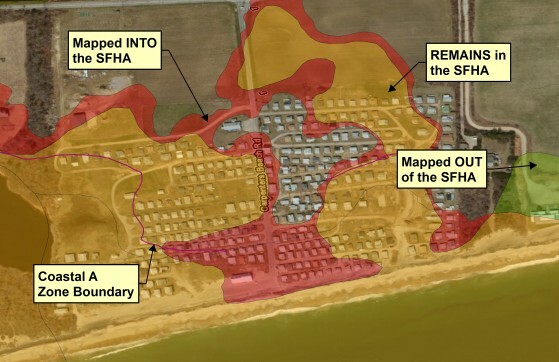 Old SFHAs are highlighted green. A magenta dashed line indicates the edge of the “Coastal A Zone”, an A zone subject to the same building code requirements as the V zone. Each designation is described in more detail here. *DISCLAIMER: The map is provided for reference only. The user of this information understands and acknowledges that the data may be inaccurate or contain errors or omissions and assumes full responsibility for any risks or damages resulting from any use of or reliance upon this data. NE&C does not guarantee the accuracy or reliability of the data generated. Always consult official FEMA Flood Insurance Rate Maps for the most accurate information. Official FIRMs can be obtained here and historic FIRMs can be found here.